Dining is available at one of the hotel's 3 restaurants, and guests can grab a coffee at the coffee shop/café. The property also has a nearby snack bar/deli. A bar/lounge is on site where guests can unwind with a drink. A computer station is located on-site and wireless Internet access is complimentary. This business-friendly hotel also offers tour or ticket assistance, concierge services and complimentary newspapers in the lobby. Parking is available on-site at a surcharge. Mercure Welcome Melbourne is a smoke-free property. 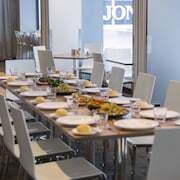 Located in Melbourne Central Business District, this hotel is steps away from Emporium Melbourne and Bourke Street Mall. 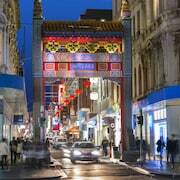 Melbourne Central and Her Majesty's Theatre are also within 10 minutes. Melbourne Central Station is 6 minutes by foot and Parliament Station is 13 minutes. Along with 3 restaurants, this smoke-free hotel has a bar/lounge and a coffee shop/café. WiFi in public areas is free. Other amenities include a snack bar/deli, valet parking and concierge services. All 330 rooms provide free WiFi and free wired Internet, LCD TVs with cable channels, and conveniences such as fridges and coffee makers. Free newspapers, in-room massages and hairdryers are among the other amenities that guests will find. 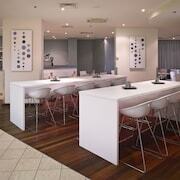 Mercure Welcome Melbourne offers 330 forms of air-conditioned accommodation with free newspapers and coffee/tea makers. 32-inch LCD televisions come with premium cable channels. Bathrooms include a shower and a hairdryer. Guests can surf the web using complimentary wired and wireless Internet access. Business-friendly amenities include desks and telephones. Additionally, rooms include an iron/ironing board and blackout curtains. Housekeeping is offered on a daily basis and in-room massages can be requested. The Louden Kitchen Grill – This restaurant specialises in local cuisine and serves breakfast and dinner. Guests can enjoy drinks at the bar. Cocoon Bar – This bar specialises in local cuisine and serves breakfast, dinner and light fare. Happy hour is offered. Soul Cafe – This Cafe serves breakfast, brunch, lunch and dinner. Guests can enjoy drinks at the bar. A children's menu is available.